Even though daily brushing and flossing should always be the first line of defence when it comes to keeping your children’s teeth healthy and clean, there are a few different types of food that can help keep things clean between brushings! Making sure your children eat wholesome, nutritious food is an important part of keeping their teeth healthy and strong. This is because nutritionally dense foods contain many vitamins and minerals that support long-term oral health. The #1 most important factor in maintaining good oral health and preventing tooth decay and gum disease is a thorough and consistent daily oral hygiene routine. There are some supplemental things you can do to keep teeth a little cleaner between brushing and flossing sessions. Certain foods and drinks, for instance, can help remove bacteria and plaque from teeth. Cheese - It may surprise you, but cheese can be very helpful in keeping teeth healthy. Cheese contains calcium and phosphate, and together these help keep the pH levels in the mouth balanced. It also preserves and rebuilds enamel. In terms of keeping teeth clean, the balanced pH levels help increase the production of saliva, which plays an important role in washing the bacteria and plaque off the teeth. Fruit - Certain kinds of fruit contain naturally abrasive elements, and eating them can gently ‘scrub’ plaque off of your teeth to a small degree. They’re absolutely not in any way a replacement for brushing, but rather they merely give your teeth a small cleanliness 'boost' throughout the day. Try apples, kiwis, and strawberries for this naturally abrasive effect. Vegetables - Veggies with some 'crunch', such as carrots, celery, cauliflower, broccoli and cucumbers can help clean gums because they require lots of chewing the break down. Onions contain antibacterial sulfur compounds, and tests show that they kill various types of bacteria, especially when eaten raw (though we wouldn't suggest this directly before a dental appointment!). Celery increases saliva productions, which neutralizes acid that causes demineralization and cavities, and helps wash bacteria away. Water - Water is important for keeping teeth clean for a couple of reasons. First of all, staying hydrated through regular fluid consumption allows the mouth to produce enough saliva to effectively wash away bacteria and plaque, and water is by far the best drink to keep you hydrated. But water also also flushes that bacteria and plaque away while you drink it. Plus, many public water supplies contain added fluoride, which can help strengthen teeth and prevent cavities. If ever you find yourself needing to clean your teeth without a toothbrush at hand, pour yourself a glass of water and swish as a stopgap cleaning method. Whole Grains - Whole grains are high in fibre, which keeps saliva flowing. And as you know by now, saliva is important in flushing away bacteria and plaque. Foods such as bran, brown rice, and whole grain cereals and pastas are good choices for whole grains. 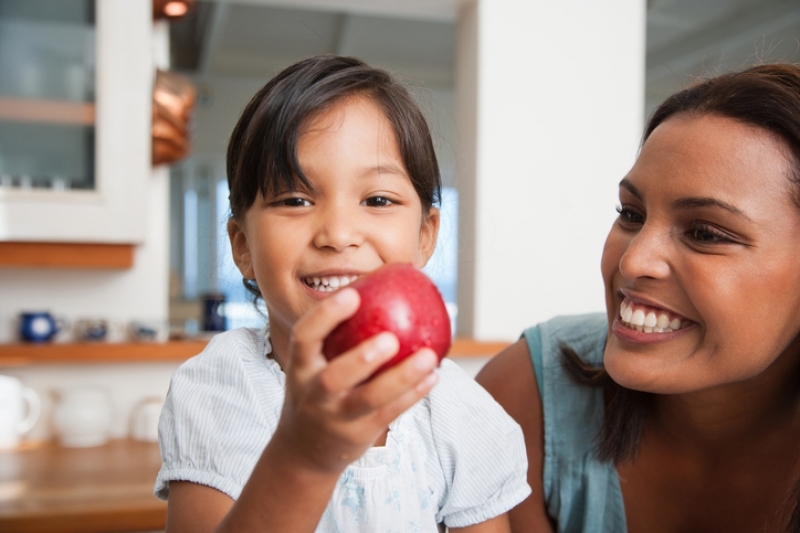 If you'd like more advice on dietary choices for children’s oral health, please feel free to contact Smile Town Langley, or read more here!